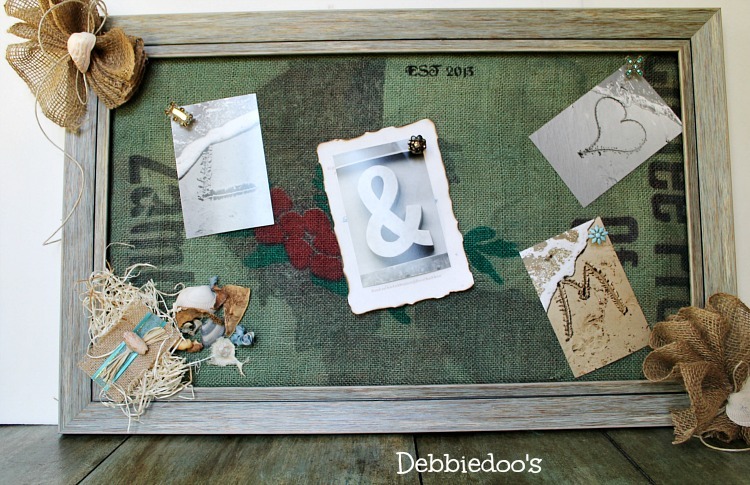 Today I am sharing a beach themed diy memo board idea for you. My very good friend Laurian was recently married in Edisto, SC. You have heard me mention Laurian here several times. our girls trip to Edisto and more I am sure. She has been a big part of my life and friendship pretty much since we have moved to the South. Love her and wanted to do something really special and different for a wedding gift. So, I went the creative route. My inspiration was first the beach of course. Then I happened to stumble across these letter photographs at our local boutique store. 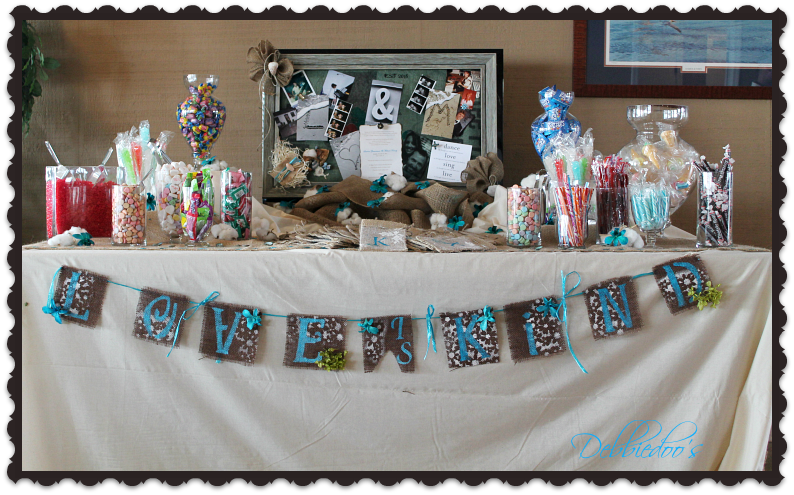 Laurians entire theme was burlap and turquoise. Wait til I show you all the little details. That gal did not miss a beat. I told her she could be a wedding planner. 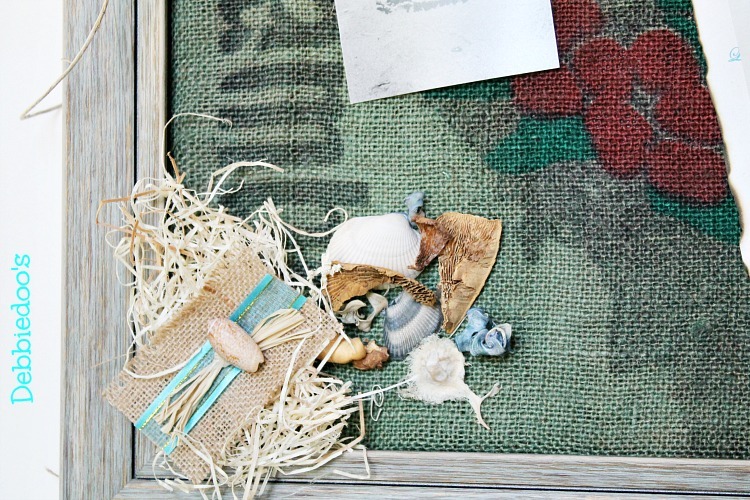 This raffia came with her invite,and the invitation was wrapped in this pretty burlap and shell sleeve. 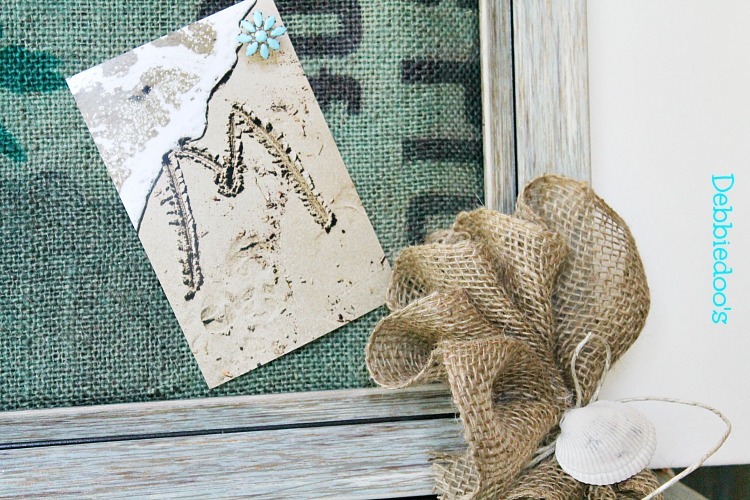 I happened to have some burlap coffee bags left so I cut it to size a frame I already had on hand. In fact it was from a memory board I did back last year. 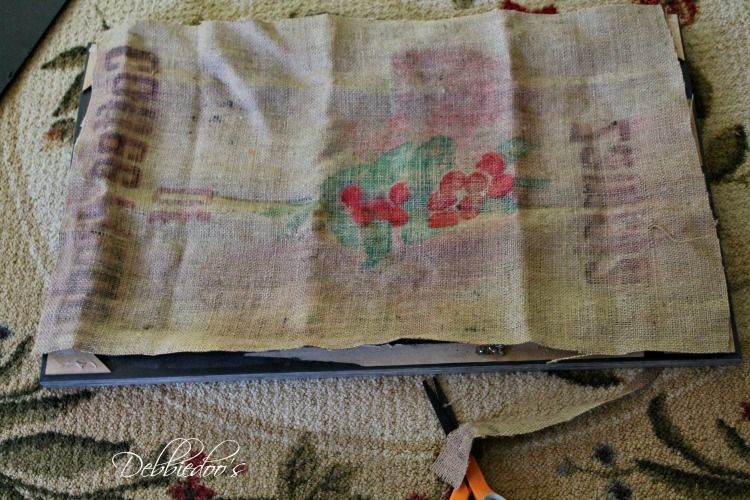 I dyed the burlap which is so easy. 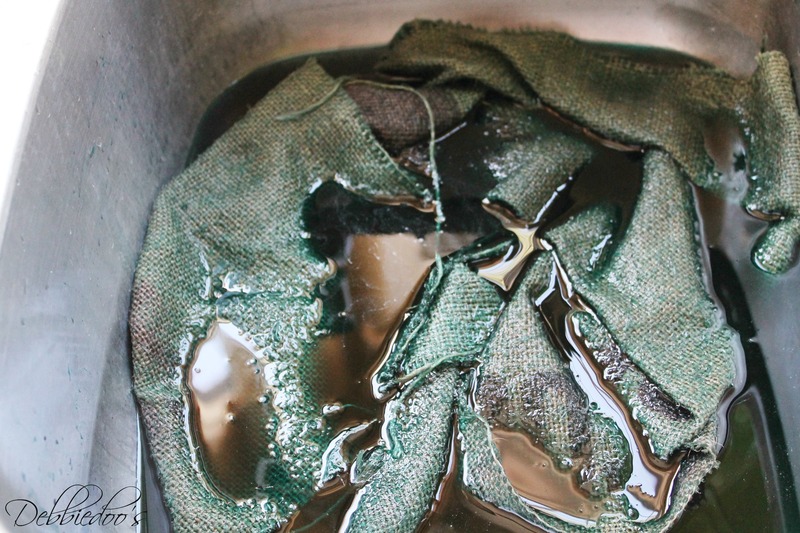 I did it in the sink with hot water and about a 1/2 cup of rit dye. I let it soak for only 15 minutes, took it with some tongs, and let it dry outside. I then pressed it when dry. I fit it to the frame as mentioned and added my cork board behind it with a staple gun on the frame. The pretty pushpin were also purchased at the local boutique store. 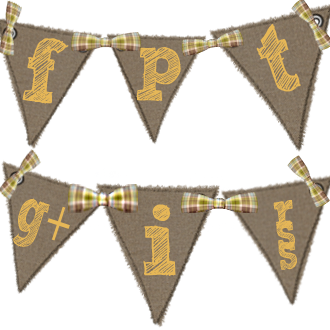 I also whipped up the burlap shell bows you see with burlap ribbon. I just folded opposite ways each fold, and tied with raffia. added a little shell of embellishment along with some shells and potpourri I had on hand. 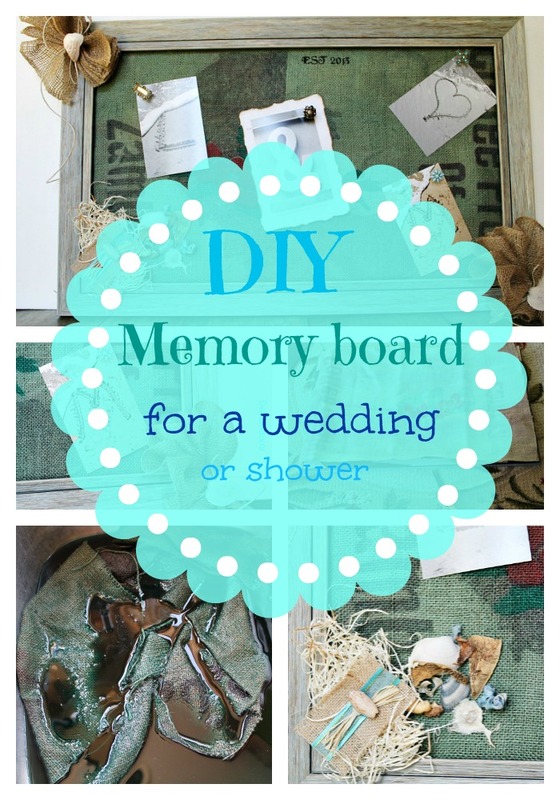 And that my friends is how you make a diy memory board for a wedding, or shower, or just because. There is more inspiration to come and I will be putting together a post soon. Beautiful Bride!! I really like the banner you did for her,how sweet. 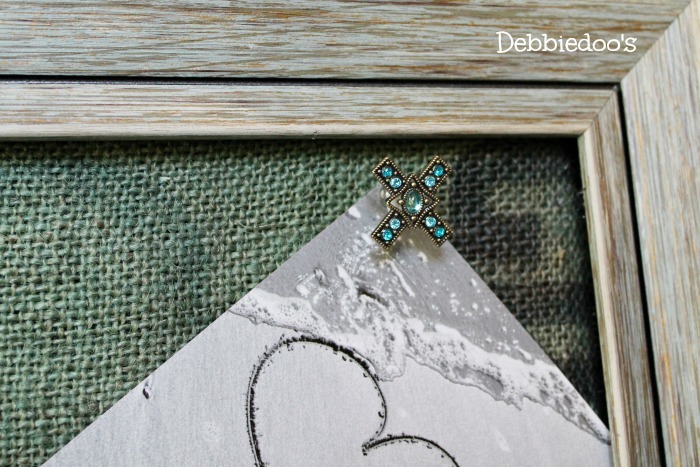 So many cute touches Debbie! 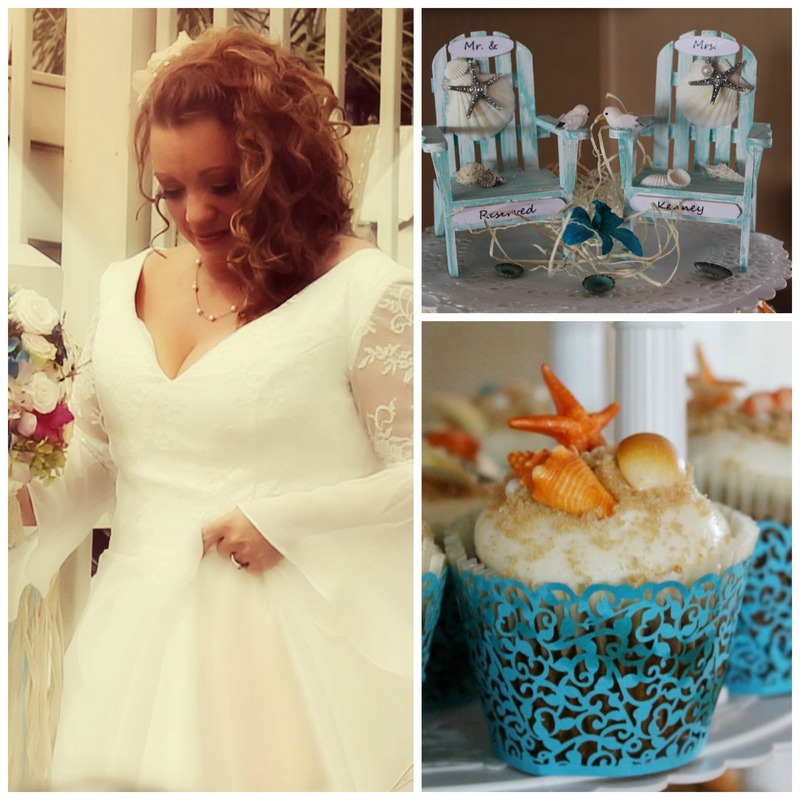 Beautiful bride and I love all of the things you created for her! She is so beautiful! And I was anxious to see these ideas. I love this and it will make a nice keepsake, too. Sweet hugs!